"I have been coming to Bundy's for more than ten years. Started with a quick nose pad replacement. The customer service was so sincere and professional I changed opticians. I now have my regular progressives as well as my sunglasses and computer glasses made here. The experience is always uplifting. Whenever I have had any discomfort or difficulty they have worked on it until I was satisfied. The work is 100% guaranteed. Class and quality: why go anywhere else." "They are incredible, Mr. Bundy is a stand out guy. Very timely and professional, he sticks to his word and gets RESULTS. Highly recommend, great prices too!" "It's been six weeks or so since receiving my new glasses from Bundy Opticians and I could not be happier with them. I am seeing so much better especially feel more confident while driving and watching movies or television is more enjoyable when able to see perfectly. The style and fit are comfortable and current. I am tempted to come in soon to purchase another pair. Thank you again, for your amazing customer service and making sure everything is perfect with the purchase of new glasses. I'm beyond satisfied!" "Wow! Even Nordstrom could learn a tip here and there from Gerry Bundy. I came in directly from ANOTHER optometrist's office that had not take responsibility for damaging (bent in multiple areas) my very expensive reading glasses. I had already signed a form saying they would not be financially responsible, so I was wide-eyed when they refused to say, "I'm sorry, we should have done better." The woman that gave me the glasses proceeded to twist them forcefully back in shape without heating them. No luck - and well, my gasps and near tears command to "stop" finally made an impression - and she handed me the glasses. I left while still calmly communicating. Thankfully, my entrance to Bundy Opticians was greeted with kindness and professionalism. My glasses, while expensive, are from the 90s. The metal castings are stronger, but the downside, is that manipulating the metal can put stress on the hinges and bridge. After I was aprised of the challenges, I accepted responsibility for my request. And, tada... all fixed. Perfect. Masterful." "I have used Bundy Opticians for more than a few years. Quality of work? Superb ! Staff knowledge? The best! Customer service? Awesome! I have dealt with Jose each time, and he takes great pains to make sure that the right specs (pun intended) and the right fit are exact for you. Measurements are done, and rechecked to be 100% spot on. Your glasses are delivered on time as promised (mine were ready earlier than I expected). 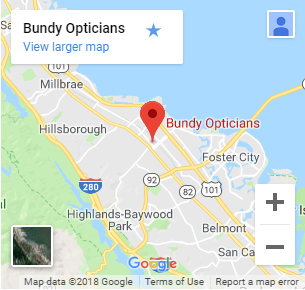 How I started going to Bundy's was that the optician that took care of me before (Mr. Gradashar) retired. He recommended Bundy's. I found out soon afterward that Mr. Gradashar himself went to Bundy's. Good verification, right? Mr Bundy himself is likewise friendly, customer orientated, and very professional. Prices are very good considering the quality and customer service that you receive. Cannot praise Bundy's enough. Cyril L. Christensson San Mateo, CA."